"I love brined turkey. 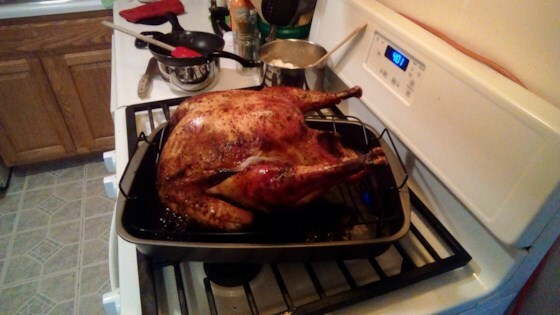 This is a lovely sweet and savory turkey great for Thanksgiving. Cook time and serving size will vary depending on the size of your turkey. The brine is made the same way regardless of the size of your turkey. Only the cook time and amount of filling will vary. You will need a cooler or clean, food safe bucket large enough to hold your bird as well as lots of icy water. I use a cooler so my directions will be written for a cooler. If you use some sort of bucket just use your judgment to match the directions. You can customize the brine using fresh herbs, seasonings, fruits, and vegetables you prefer." Stir chicken broth, apple juice, brown sugar, salt, dried sage, and peppercorns together in a large stock pot; add apple halves and crushed garlic cloves. Bring the mixture just to a boil, stirring to dissolve sugar and salt. Remove from heat immediately. Pour enough ice into a large food-safe container to be about half full. Pour chicken broth mixture over the ice; stir to cool liquid completely and evenly. Gently lower turkey into the liquid with the breast facing down. Brine turkey 24 to 36 hours, adding ice as needed to keep the brine and turkey cold. Remove turkey from the brine and rinse well with cold water. Pat turkey dry with paper towels. Mix apple quarters, onion wedges, whole garlic cloves, and fresh sage leaves in a bowl; loosely stuff into cavity of turkey. Move the turkey to a shallow roasting pan. Lightly coat the turkey's skin with olive oil. Bake the turkey in the preheated oven until the skin on the breast of the turkey is golden brown, about 30 minutes. Reduce heat to 350 degrees F (175 degrees C), cover turkey with aluminum foil, and continue roasting the turkey until no longer pink at the bone and the juices run clear, about 6 hours. An instant-read thermometer inserted into the thickest part of the thigh should read 180 degrees F (85 degrees C). Remove the turkey from the oven, cover with a doubled sheet of aluminum foil, and allow to rest in a warm area 10 to 15 minutes before slicing. A secret ingredient helps create a succulent holiday turkey. Always brine foods in a food-grade, non-reactive container such as a stainless steel or enameled stockpot, a brining bag, or a food-grade plastic bucket. Never use ordinary trash bags, plastic trash cans, or metal buckets or containers not meant for food use. Most amazing, beautiful turkey ever! The skin just wasn’t crispy, so I’ll try uncovering it for the last 20-30 min next time.